To many people in Japan, summertime is synonymous with hot and spicy food. Spices are believed to cool you down by making you perspire, as well as stimulating an appetite dulled by the sweltering weather. The quintessential spicy dish in Japan is curry, which is so popular that it’s regarded, along with ramen, as one of the top two national dishes — ahead of sushi and miso soup. The spice mix known as curry powder and curried dishes were most likely introduced to Japan via the Anglo-Indian officers of the royal Navy and other stalwarts of the British Empire. They were among the first Westerners the Japanese came into contact with, after Commodore Matthew Perry landed his Black Ships at Kurihama in 1853, opening the country to the world after hundreds of years of isolation. Since this new dish came from the West, as far as these Japanese travelers were concerned, it was classified as yōshoku (Western food). Nowadays, yōshoku is a distinct type of cooking that encompasses Western-style dishes that have been reinvented to suit Japanese tastes and ingredients. 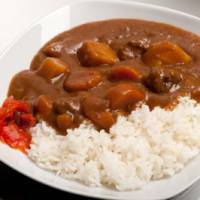 Japanese curry is no exception: Bearing only a passing resemblance to curried dishes from other regions such as India, it has been changed and adapted so much that it now stands on its own as something uniquely Japanese. In fact, it’s a home comfort that many can’t bear to be without. Before every Seattle Mariners home game, baseball great Ichiro Suzuki eats the same curry, made by his wife, for lunch (actually breakfast for him, since he “works” into the night). When this was reported on NHK TV in 2009, it caused a short-lived fad for breakfast curry around Japan. The earliest recipes for raisu karī (literally “rice curry”) appeared in Japanese cookbooks in 1872. One of these is very similar to curry recipes that appeared in British cookbooks of the time, such as “Mrs. Beeton’s Book of Household Management.” It’s a simple meat and vegetable broth thickened with a spoonful of flour rather than roux, and contains chopped apple — as does a Mrs. Beeton recipe for curried veal. It does include yuzu juice as an ingredient, presumably in place of lemon, so adaptations were already being made. Roux (which is a sauce-thickener in French cuisine) seems to have been adopted by Japanese curry chefs quite early on, possibly because it thickens a sauce more smoothly and reliably without making lumps. Rice curry (initially pronounced as karī, and changed to karē sometime around the turn of the 20th century for unknown reasons) appeared on restaurant menus in Tokyo as early as 1877. 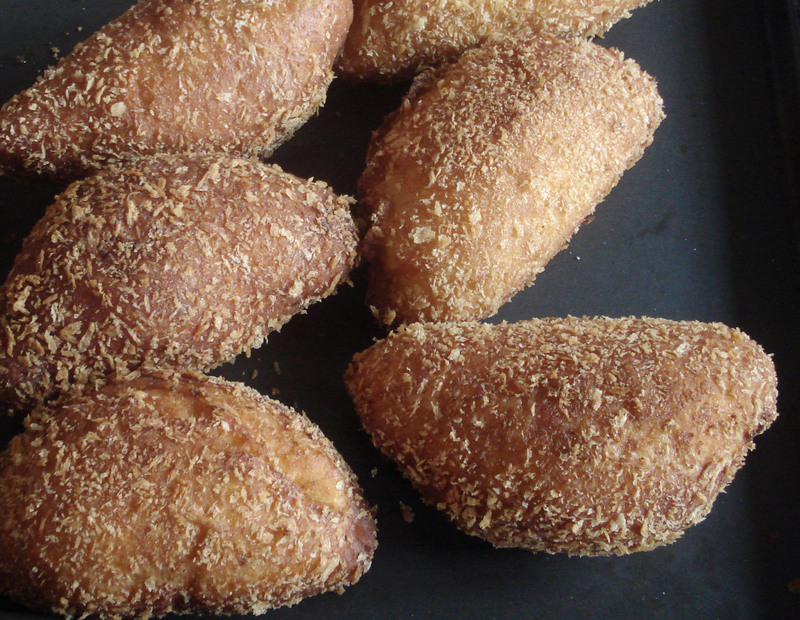 At first, it was considered to be quite exotic and expensive, like all Western food. Not only was preparing a proper curry sauce a time-consuming affair requiring the skills of a professional chef, but imported curry powder from Britain — considered to be far superior to the domestic kind — was a luxury only affordable by the rich. This all changed after the great curry powder scandal of 1931, when unscrupulous dealers were caught selling cheap domestic curry powder as expensive Crosse & Blackwell powder from England. This escalated to an international diplomatic incident, leading to several arrests, but it ironically gave a big boost to domestic curry-powder manufacturers such as S&B Foods, since people discovered that they couldn’t really taste the difference. More and more inexpensive eateries started listing curry dishes on their menus, coming up with inventive items such as karē udon (udon noodles in curry-flavored soup), karē nanban (soba noodles in curry-flavored soup) and karē pan (dough stuffed with curry paste, breaded and deep-fried). The biggest factor in spreading the popularity of curry nationwide was the introduction of “instant” curry mixes. The forerunners of present-day household names such as House Foods and S&B started to distribute powdered curry mixes on a large scale in the late 1920s. The solid-block type of curry mix that is most popular today was first introduced in 1954; containing roux thickener and various flavor enhancers such as vegetable or meat concentrate, they’ve been a staple of Japanese home kitchens ever since. 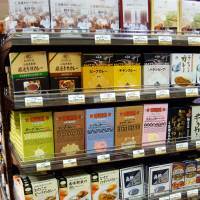 These days, the curry-mix marketplace in Japan is fiercely competitive. Besides the aforementioned big names, several noteworthy yōshoku restaurants produce their own “gourmet” brands. In 1963, House Foods introduced a curry mix called Vermont Curry. Containing apple concentrate and honey, it was much milder and sweeter than other mixes, and helped to change the perception that curry was too spicy for children. karē raisu (curry rice) has been a perennial kids’ favorite ever since, and has been the most popular dish on the national school lunch menu for at least three decades. 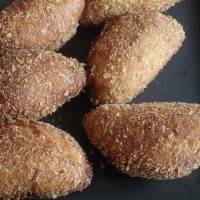 It’s also a versatile dish, resulting in all sorts of variations. Emperor Akihito reportedly enjoys regional curries during his visits around the country; and when famed TV comedian Tamori revealed his own special curry recipe, it became popular in its own right. 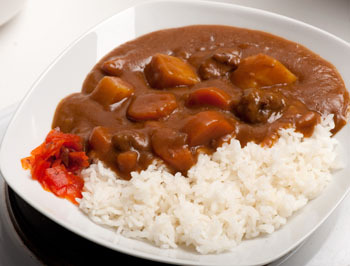 Curry is also a staple of the armed forces in Japan. It’s a tradition to serve karē raisu for dinner every Friday on Japan Maritime Self-Defense Force ships, a carryover from the Imperial Navy days. Each JMSDF ship prides itself on having its own unique curry recipe, some of which are featured on the JMSDF’s official website. Ready-to-eat curry sold in “retort” (pressure-cooked and vacuum-sealed) bags that can be heated in hot water were introduced in 1969, becoming an instant hit. They’ve been a staple of a hungry student’s diet along with cup ramen noodles ever since. Curry packs were even introduced to the NASA space program’s menu by Japanese astronaut Mamoru Mohri in 1997. Since they need no refrigeration, they’re popular as emergency food rations too. Both Ezaki Glico and House have recently introduced ready-to-eat curries that don’t need to be heated up to be tasty, as a response to the increased demand for such items after the March 11 earthquake. Indian, Thai and other south Asian restaurants have proliferated in recent years, exposing Japan to many other types of curry dishes. Japanese curry still holds a special place in our hearts though. It’s what we grew up with. Makiko Itoh is the author of “The Just Bento Cookbook” (Kodansha International). She writes about bento lunches at www.justbento.com and about Japanese cooking and more at www.justhungry.com. This recipe goes back to the roots of Japanese curry; it’s almost a rich beef stew. Beef symbolized the opening of the country to outside influences in Meiji Era Japan. Leftover curry freezes well, but take out the potatoes or they will turn into mush. 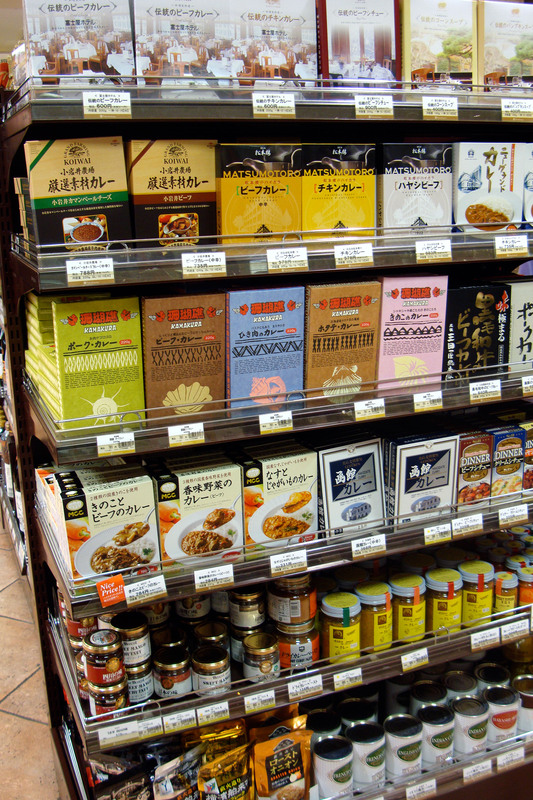 Japanese curry mixes are labeled with their level of spice. Amakuchi is quite sweet, chūkara is medium and karakuchi is hot. I usually use a chūkara mix and add some red chili powder at the end if I think it needs more heat. Heat 1 tbsp of oil in a heavy-bottomed pan over high heat and add the beef. Saute until well browned. Take the meat out and set aside. Add the rest of the oil and the butter to the pan; add the onion, garlic and ginger. Saute over medium-low heat until the onion has lightly browned. Turn the heat up to high and add the carrots, potatoes and beef. Saute briefly, then add 1.5 liters of water and the bay leaves. When the pot starts to boil, lower the heat to a gentle simmer. 20 minutes in, remove the potatoes with a slotted spoon or spatula (this prevents the potatoes from disintegrating). Continue simmering the sauce until the meat is falling-apart tender, an hour or more. Remove the pot from the heat. Add ½ cup of water to cool down the sauce, then add the curry mix, broken into small chunks. Stir until the mix has melted completely. Add the cooked potatoes back and reheat the sauce over a medium-low heat — do not let it boil. Add a little red chili powder to taste if needed. Put some hot steamed rice on one half of a shallow bowl; pour the curry on the other half. Serve with fukujinzuke (a chopped vegetable pickle, pictured), rakkyo (pickled shallots), grated cheese or a raw or boiled egg.